And it looks like it'll be finished off with a new MonMon Memo! The 16th installment goes over details of a number of announcements that were made today, with Big Dreamer Taoka returning to go over these new things. He points out the hot summer has arrived... speaking of summer... it's a summer of Adventure... Summer of Digimon Adventure! This time the Digivice has 16 characters total, 8 children and 8 partner Digimon, which appeared in Digimon Adventure. The adventure of the summer of 1999 is revived, so they chose the name CSA Digivice 1999 because it's easy to understand. -A new feature for the CSA series! As you listen to dialogue, they've introduced a 'cut-in system' in which songs will automatically flow at set timing. -For example, you can reproduce scenes from the animation, such as Butter-Fly theater version flowing after the exchange between Mimi and Palmon from tne end of Adventure. This should add immersion for fans more than ever. -Lines that can only be heard with this Digivice. 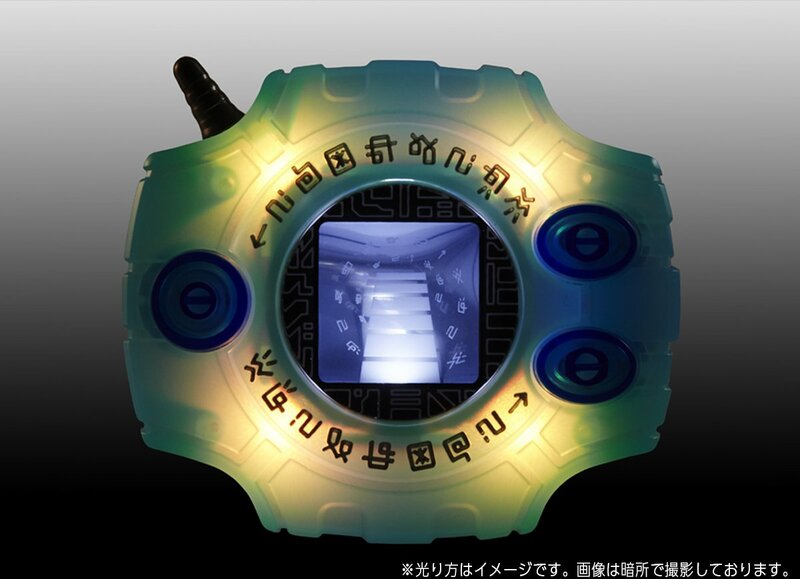 New dialogue has been recorded for the 8 Digimon which can only be heard with the CSA Digivice 1999! Recording was done under the supervision of Adventure Director Kakudou. MonMon Memo next month will go over the state of the recording. Butter-Fly and Brave Heart, songs from Digimon Adventure since it aired in 1999, along with the version of Butter-Fly theater size from the final episode are included here for the first time. Just like the CSA Digivice, you can listen to evolution dialogue by pressing the correct button while the song is playing. The screen lights up, changing from a mirrored surface to one with the unique background design elements you'd expect from Digimon Adventure to help you feel the world of Digimon Adventure more and more. As you can see in the image, it has not only speecha dn BGM audio, but 4 LEDs ill light up to make the body of the Digivice shine. The LEDs let you change to each child's color. The body color has a bit of a dark coloration when the lights are on, whi ch should give the light an especially beautiful appearance. He believes those who have read up to this point will understand that this is meant to be an item full of charm that's also playful and nostalgic. In addition, since it's being delivered in January, you'll have it on hand for Digimon Adventure's 20th anniversary on March 7th. The included original booklet is filled with comments and content from the animation production team. Information about the book, and more about the Digivice itself will show up in a future MonMon Memo. Next up is the lifesize Terriermon plush! Terriermon, who actually finished first in a poll for future life size Digimon plush is finally coming out! The delivery time will be in the cold of January, so you can wrap it around your neck like in the photo above to have a muffler style Terriermon. These two items are being introduced now, but there will be an introduction section on the streamed version of Digimon Thanksgiving, which is scheduled for this Sunday. On top of the product announcements, they began the Digimon X-Antibody Super Vote today. This project will let fans vote, and the top two choices will become X-Antibody Digimon. The Digimon who win first and second place will get official illustrations and there are even plans to put them in a future LCD toy. In addition, they put up the Digimon Chronicle X page today on the official Digimon website. The rather large portion that has a mock 'glitch' effect over it. Next week MonMon Memo will go over details of the CSA Digivice 1999. I really don't like how it's just a CSA Tri repaint. It means the entire thing isn't show accurate.